I would also like to master the art of wrapping presents so they are a delight in themselves. Kathryn my daughter in law always wraps her presents so beautifully. 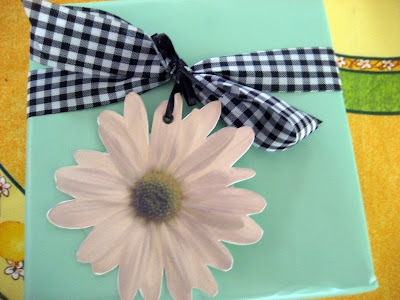 This one was simple but I just loved the green paper with the touch of gingham which I think is a great combination. Her attached flower card just copied and printed on the computer. What a great idea! 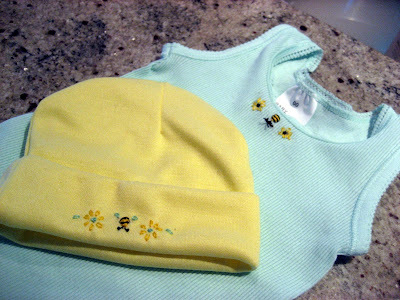 So cute...the embroidered baby clothes! 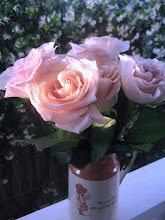 And great ideas for gift-wrapping as well! I think the embroidered pieces are adorable! The sweetest touch. I agree with you on gift wrap, too. I love to wrap a beautiful present!